“I think Lyndon LaRouche — somebody’s putting up a lot of money for Lyndon LaRouche. At one time, he was actually for the Communists. In fact, he tried to get the — if you read my book, AIDS: The Unnecessary Epidemic, we go into the background of LaRouche, the part he played in the AIDS epidemic, and of course, betraying the American people. But Lyndon LaRouche, actually, was so radical, that the communists wouldn’t even join with him. Much of what he says is absolutely true. Many of the things, that his historical facts are absolutely true. 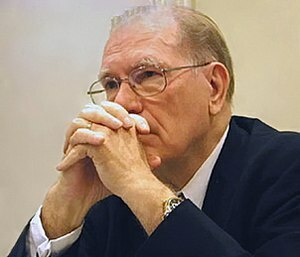 I would ask you: who puts up the money for Lyndon LaRouche? LaRouche is not controlled opposition. He gets funding from his members and from many donations. I have donated for instance because LaRouche is the only person who has the answers. I’m talking about complete answers rather than solutions to aspects of the problem. I encourage everyone to read deeply into LaRouche. He has an amazing mind.